Nothing warms you on a winter day like a bowl of soup and a slice of crusty bread. But, especially around the holidays, not all of us have time to sink into making stock and chopping veggies. And soup to go can be an iffy proposition. 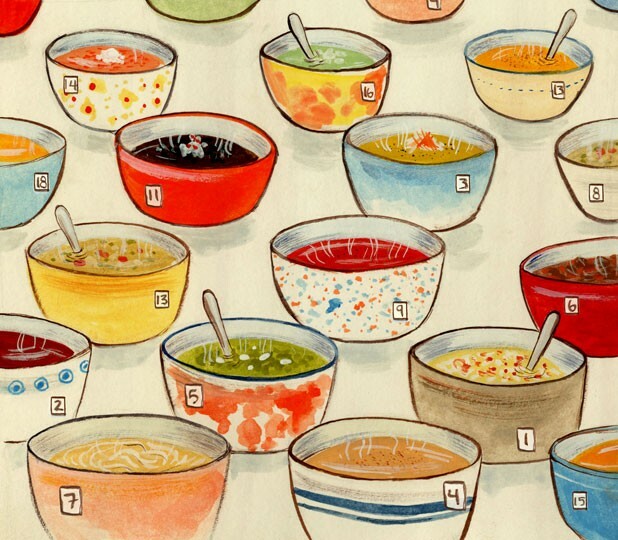 The Seven Days staff often craves the comfort of a homemade potage at work. But, even after years at our Burlington offices, our team had yet to find a favorite. Last week, we embarked on an admittedly unscientific survey of the five cafés closest to our South Champlain Street office (another, Fresh Market, recently closed). The only other qualifying factor was that the restaurants had to offer at least two daily soups. Food writer Alice Levitt assembled a crack team of tasters for the honor of gorging on 10 different concoctions during one lunch hour. Kids VT managing editor Carolyn Fox was the tough critic most eager to find the best soup available. Calendar writer Courtney Copp is a former personal chef with some great recipes of her own. As a vegetarian, she tasted meat broths but didn’t chomp down on actual flesh. Circulation manager Steve Hadeka was along for the ride as one of our most-willing reviewers in past tasting challenges. Together, we separated the creamy classics from the bland slurries. Though our results are the tastes of only a single day at each eatery, we learned a few important lessons: Bisques are good; needlessly thick soups are bad. Chefs should be purposeful in their choice of ingredients. A kitchen-sink soup will probably taste like just that. And, most importantly, chefs, taste your food before you send it out! Carolyn Fox: The carrot soup was so silky! It tasted like drinking brown butter from the pan — rich and indulgent. The large chunks of carrot were perfectly tender, while the rosemary was nicely restrained; a little went a long way. I try not to eat the cuter animals, so this [lamb and barley soup] is actually the first time I had lamb. It was, um ... super lamb-y. I was the only one who appreciated the barnyard wallop of the meat in the lamb and barley soup. But, despite my enjoyment of the flavor, the ground-meat texture made me think more of Hamburger Helper than homemade stew. Steve Hadeka: We got clobbered by carrots in many of the soups in this shoot-out, so it was refreshing to see them used so subtly here. Likewise, the rosemary just whispered in the background. All this in a broth that really tasted like it was made by an actual chef — plus almost-movie-theater amounts of butter! Courtney Copp: Even when I ate meat, I wasn’t a big fan of lamb. All I can say about this broth is that it was punch-me-in-the-face lamb. One bite and my spoon was down. AL: A film of red oil on top of the beef stew raised my reservations, but the hint of spice and cinnamon was an exotic treat, even if the complete package was too thin to satisfy me purely as a stew. The split-pea soup smelled like a health-food store and needed salt. A hint of fennel was a pleasant touch, but, sorry — carrots are no substitute for smoky pork hocks. CC: The fragrant beef broth had me intrigued. When I tasted it, however, my curiosity waned. Its sweetness and lingering oil harked back to a childhood of dumping white vinegar into my grandfather’s stews. Pass the acidity, please. SH: The hearty broth of this stew featured hints of cinnamon and other spices, just not enough to elevate it much above Dinty Moore status. But hey, it’s beef stew, for chrissake. CF: Some of the vegetables were overly soft, while the beef was a bit chewy for soup. But the red-orange broth was warm and comforting, with just a touch of heat — it would be nice on a cold winter’s day. The split pea was thick, like a stew, and very starchy. I felt like I had just tried to swallow cotton. For being packed with vegetables, it didn’t have much flavor. SH: This soup was heavy on the chicken and light on the “Thai.” It might have passed for Thai 15 or even 10 years ago, before greater Burlington’s Thai and Vietnamese revolution, but let’s face it, we’ve all become a little more worldly thanks to the solid offerings of spots such as Tiny Thai and Pho Hong. So, yeah, not a bad soup, but in 2012 it takes more than a dash of coconut milk to make something Thai-tasty. Sweeter and browner than the Stone Soup version, this split pea won the Linda Blair Award for the day (come on, what pea-soup review would be complete without an Exorcist reference?). AL: Sure, the Thai chicken could have used some galangal or kaffir lime, but I still found the coconut-y broth satisfying. More spice would have been nice, but I was happy to be practically drowning in tender chicken. The split pea splorped out of its container into the bowl like thick applesauce. If only. A glut of pepper made it almost inedible. Neither soup combined well with the provided olive bread, which is delicious on its own — two tastes that did not taste great together. CC: Having lived in the Thai-food mecca of New York City for nine years, I’ve spent plenty of time plucking thin strips of chicken out of my boyfriend’s soups and downing the rest. While it’s not fair to demand the best of the big city’s cuisine elsewhere, I had visions of a not-too-sweet coconut-milk base with perfectly wilted cilantro or basil balancing things out. This broth was too thin for my liking and tasted more like plain chicken broth than anything else. SH: With the full spectrum of winter vegetables available to us, I couldn’t wait to have my hair blown back by what would surely be an almost psychedelic blast of color. What did I find instead? Khaki. This soup was, without exaggeration, both the color and flavor of Dockers’ worry-free, relaxed-fit khakis. As for the turkey veg, I could swear this soup came straight out of the Castleton Elementary School hot-lunch program. CC: I call the Nordic vegetable soup monotone medley. I call the flavor ... wait, what flavor? CF: What’s in the Nordic vegetable? Is it meat? Why was there ziti in my turkey soup? This tasted like something you’d eat at a hospital. AL: I trusted the gourmet cooks at Mirabelles to do better, especially with tantalizing nonsoup specials that day including vol-au-vent with lemon chicken and considering the superb quality of its baked goods. The parsnip-filled veggie soup tasted like the work of Mom on a health binge. Metallic-tasting chunks of hard turkey dominated the other soup, amid an odd assortment of starches, including overcooked pasta and chickpeas. AL: The bisque would have made perfect sense served in china on a white tablecloth. The silky, well-seasoned and creamy potage deserved better than the Solo cups from which we drank it. I may have been even more impressed with the ultra-beefy Wedding soup. The meaty broth had an almost grilled flavor, as did the tender meatballs. This was the best-balanced soup of the day, with just enough acid and the perfect amount of salt to draw out every bit of flavor. SH: My wife, Maggie, and I really miss Smokejacks. Our favorite dish was the butternut-squash soup they ran as a special in colder months. Chef’s Corner’s version of the soup was every bit as good and achieved what I presume to be the place’s mission: offering actual gourmet food in a handy grab-’n’-go format. CF: The Italian Wedding meatballs were nice and garlicky, and the soup was loaded with onion, rice, carrots and herbs. Individually, all the parts were quite nice. But the broth was overwhelmingly salty for me — it reminded me of fish sauce. CC: Chef’s Corner delivered in a big way. The bisque was a perfect shade of orange, just the right thickness and full of flavor. Sometimes all it takes is a handful of ingredients prepared with care. By far my favorite of the bunch. To be fair, I hadn’t yet come down from my butternut-bisque high when I sampled the Wedding soup. The broth was full of herbs and greens, and I detected notes of thyme, which I love. A bit salty for me, but, again, by that time my palate had had enough.